Record every discovery in your wine journey. That '82 Bordeaux, '94 Napa Cab, and 75 other wines you've tasted live on in this handsome journal from Italy. Jot your notes down on ivory-colored bond paper, and paste your wine labels as lasting mementos. Entry descriptors (vintage, taste, etc.) are in English and Italian. With burgundy bonded leather cover and gold ribbon marker. 155 pages. Does this item have www.wineenthusiast.com embossed on the back of the cover ? BEST ANSWER: I actually don't know. It was a gift to a family member and I have not seen it since it was given a year or two ago. Sorry, wish I could help more. Does it have www.wineenthusiast.com embossed on the back of the cover ? BEST ANSWER: Can't remember. Gave it as a gift last Christmas. My best guess is yes. They tend to brand everything. I was wondering if you could add additonal pages to this or if you have any other wine tasting journal that does allow you to add additional pages. You cannot add pages to the journal due to the nature of the binding. Unfortunately, it is the only journal available on the website. Does this come with materials to help you remove the labels from the bottle? purchased separately item 590 13 10. Can I have this journal personalized with intials? BEST ANSWER: Hello Matt and thank you for your question. Unfortunately, we are not currently offering this product with personalization. I will bring your suggestion to the attention of our Buyer responsible for this item so that it may be available in the future. Thanks again. The book is quite nice, leather bound, but... I intended to give it as a gift, but it has www.wineenthusiast.com embossed on the back of the cover. That makes it look like a promotional gift that I got for buying a lot of wine and that I am now regifting as an after thought. Big con and I returned it. 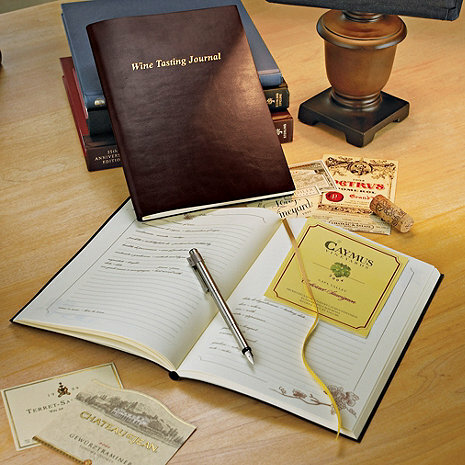 I absolutely love this wine tasting journal. The pages are beautiful, printed on thick sturdy paper. Everything is written in English and Italian. Great gift for a wine lover. Husband loves to write his preferred wines down as we try numerous ones. We love this Journal. I believe we are now on our 10th Journal. It keeps the new and interesting labels. Helps us reference wines that we love and want to buy again. Or wines we cannot stand or rate low so do not buy again by mistake. My husband and I enjoy filling it out together, sharing our opinions and ratings.